This name uses Spanish naming customs: the first or paternal family name is Colón and the second or maternal family name is González. Carlos Edwin Colón González Sr. (born July 18, 1948) is a Puerto Rican professional wrestler, and wrestling promoter, better known as Carlitos Colón or simply Carlos Colón. He is, along with Victor Jovica, an owner of the Puerto Rican wrestling promotion World Wrestling Council (WWC), where he has held the WWC Universal Heavyweight Championship a record 26 times. He is the patriarch of the Colón wrestling family, composed by his sons Carly and Eddie, daughter Stacy and nephew Orlando. In 2014, he was inducted into the WWE Hall of Fame and the following year into the Wrestling Observer Newsletter Hall of Fame. Due to his admiration for wrestlers Antonino Rocca and Miguel Pérez, Colón became a member at the gym they trained at in New York, practicing wrestling moves and cleaning the place occasionally to pay his dues. His dedication and affability helped him gain the respect of his peers, as well as the occasional wrestling match. His first bout occurred in Boston, Massachusetts, on February 16, 1966, when he wrestled Bobo Brazil. Colon was paid US$15.00 for his participation in his first match. He eventually became an itinerant wrestler in the eastern states of the United States and in Canada, including 1 match in the World Wide Wrestling Federation (WWWF) in December 1967, and several in 1968. Over the following three years, with Montreal as his place of residence. Feeling homesick and noticing a void in the Puerto Rican wrestling scene, Colón returned to Puerto Rico in 1973. Colón and Croatian-born wrestler Victor Jovica founded a promotional company, Capitol Sports Promotions, which aired wrestling television shows each Saturday and Sunday on WAPA-TV. He wrestled during a time where local stars such as Barrabas, Black Georgie and Miguel Pérez, Sr. shared the spotlight with international wrestlers such as Argentine-born Rocca, Cuban-born Huracán Castillo and others. He set the stage for local stars such as Los Super Médicos, Los Invaders and Chicky Starr to develop. His wrestling company was also responsible for inviting major American wrestling stars such as Randy Savage, Ric Flair, Bruiser Brody, Stan Hansen and others to wrestle in Puerto Rico. The nemesis of Colón's character was Abdullah the Butcher, with whom he staged a long-standing feud which lasted almost two decades. Colón is quoted as saying: "Eighty percent of the blood I've shed in the ring I've shed because of Abdullah." On January 6, 1983, Colón defeated Ric Flair in a match for the NWA World Heavyweight Championship. However, the outcome of this match was not made official or aired on NWA television. Flair received the belt back in a phantom title change that took place on January 23, 1983. Later that year, Colón required hospitalization due to injury following a match against Bruiser Brody. This loss was publicized and made the covers of El Nuevo Día and El Vocero, both of which are mainstream newspapers. Two weeks later, Colón defeated Brody in a rematch. In December 1983, Capitol Sports Promotions began a feud between Colón and Flair, which included a skit where the NWA champion criticized Capitol's title claiming that he was the only "real world champion", leading to a steel cage match to determine the "undisputed champion of the Universe". The encounter headlined an event held in Bayamón on December 18, 1983. Colón won cleanly, and the WWC World Heavyweight Championship was renamed to Universal Heavyweight Championship as a result. In subsequent interviews, Flair has stated that the NWA title was not on the line for this match because an official unification was proposed, but he vetoed it. On January 24, 1993, Colón made a one-night return to the WWF, then known by the abbreviated name World Wrestling Federation, making an appearance in the Royal Rumble. After this, he decided to temporarily retire from professional wrestling, choosing to help train his sons, Carly, and Eddie, who have followed Colón into the sport. Carlos Colón appeared on the September 11, 2006, episode of WWE Raw from Madison Square Garden in the audience cheering his son Carly, known as Carlito in WWE. He also negotiated a deal for his other son Eddie Colón to work for World Wrestling Entertainment. Colón held a retirement ceremony at Aniversario 2008, which was organized in the José Miguel Agrelot Coliseum on July 19, 2008. However, Colón left this retirement on September 8, 2012, defeating Félix "Barrabás" López in his return. After Carly Colón turned on him and gained control of the heel faction, Colón joined Gilbert Cruz and Ray González in a three-on-three match against his son, López and Germán Figueroa, but his team lost. On February 9, 2013, he lost to Savio Vega in a match for WWC's ownership. This evolved into a feud with the heel faction, while a secondary storyline involved a legal battle over the promotion. Colón defeated José Huertas González to recover ownership of WWC, but lost a rematch the following month. At Aniversario 2013 he teamed with Stacy Colón and defeated José Huertas González and "La Tigresa" Soldelina Vargas. Colón announced another short-lived retirement. He returned at Lockout 2013, resuming this feud by losing to Huertas González in an ambulance match, with both wrestling a no contest at Euphoria 2014. Colón's name began being rumored as a possible inductee to the WWE Hall of Fame in late 2011. Despite expressing joy at the idea of accompanying Pedro Morales, he dismissed this as a rumor and noted that WWE personnel had not formally contacted him. Ultimately, the 2012 Class did not include him. The following year, Eddie and Orlando Colón noted that they supported a potential induction. On March 11, 2014, Colón was officially announced as part of that year's class. He considered it the "realization of a dream" and admitted that at one point, he began to doubt that he was ever being inducted. This class was completed by The Ultimate Warrior, Jake Roberts, Lita, Paul Bearer, and Mr. T. He was inducted by his sons Eddie and Carly, and nephew, Orlando in the official ceremony held at the Smoothie King Center in New Orleans, Louisiana. Colón became the third Puerto Rican inducted, the first being Morales and the second being New York-born Johnny Rodz. WWC held a series of homages, the first of which was held by his immediate family. A more formal ceremony was held on March 30, 2014, and included the participation of long-time rival Chicky Starr, who participated in a skit where he expressed his respect and ended their animosity. The promotion went on to announce a Puerto Rico-wide tour, "La Despedida de Carlitos Colón", which would mark Colón's final retirement. Colón was born in the Jauca Ward of Santa Isabel an agricultural community in southern Puerto Rico. One of seven children, he emigrated to Brooklyn, New York in 1961 along with the rest of the family led their by his mother, Esther González. Colón is married to a Canadian national named Nancy, who is the mother of his children, Carly, Eddie, Stacy, and Melissa. He is the brother of accountant José Colón, who has made several non-wrestling appearances in WWC and is also the father of his nephew and fellow wrestler, Orlando Colón, known by the ring name of Epico. Colón's career has left him with over 70 scars on his forehead. He has publicly stated that he exhibits them with pride, considering them the proof that reflects the arduous work done during all of the bloody bouts in which he has been involved. Colón is WWE's representative in Puerto Rico, promoting the house shows held by the company there. He has appeared on WWE programming, including the December 24, 2009, episode of WWE Superstars where he supported Eddie, known as Primo in WWE. 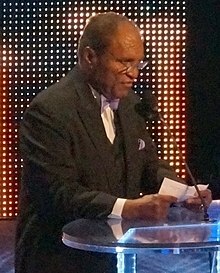 Afterward, Colón made another appearance for WWE, attending its 2012 WWE Hall of Fame ceremony. He attended as a guest of his son and nephew, who held the WWE Tag Team Championship at that time. Colón's main interest was to see the inductions of Great Kokina and Mil Máscaras, both of whom worked for him in Capitol Sports Promotions. 1 ^ Colón's reign is not recognized by the National Wrestling Alliance. ^ a b c d e f Drake, Timothy (June 2007). "Who is this Carlos Colon, anyway?". The Wrestler/Inside Wrestling. Kappa Publications. p. 67. Volume 15, 2007. ^ a b c d e Shields, Brian; Sullivan, Kevin (2009). WWE Encyclopedia. DK. p. 58. ISBN 978-0-7566-4190-0. ^ Buck Woodward (2007-04-02). "Ric Flair: The 16-time... 18-time... 21-time... Exactly how many times has he been World Champion?". PWInsider. Retrieved 2014-04-06. ^ a b Armando Rodriguez (2006-02-03). "Historical Perspective: The WWC Universal Title 1982-1992". 411mania.com. Archived from the original on 2012-08-05. Retrieved 2014-04-06. ^ Lester Jiménez (18 July 2008). "A su última batalla Carlitos Colón" (in Spanish). Primera Hora. Archived from the original on February 11, 2009. Retrieved 27 July 2008. ^ "Voy a arruinar el regreso de Carlitos Colón" (in Spanish). NotiCel.com. 2013-02-08. Retrieved 2014-04-06. ^ "Primo y Épico quieren que Carlos Colón sea exaltado al Salon de la Fama de la WWE" (in Spanish). Súper Luchas. 2013-01-07. Retrieved 2014-05-06. ^ "Anunciarán "despedida" de Colón" (in Spanish). Puerto Rico Wrestling. 2014-04-05. Retrieved 2014-04-05. ^ "Aniversario 2008: éxito rotundo" (in Spanish). World Wrestling Council. 20 July 2008. Archived from the original on April 22, 2009. Retrieved 24 July 2008. ^ Jorge Figueroa Loaza (2014-04-05). "Carlitos Colón: con la frente en alto" (in Spanish). El Vocero. Archived from the original on 2014-04-07. Retrieved 2014-04-06. Wikimedia Commons has media related to Carlos Colón. This page was last edited on 25 April 2019, at 02:18 (UTC).